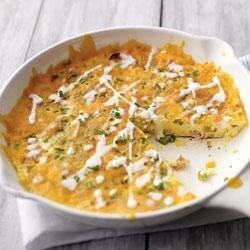 "This delicious frittata with green peppers, green onions, and smoked ham is drizzled with creamy Philadelphia Cooking Creme, and it's ready to serve in 30 minutes." Spoon 2 Tbsp. Cooking Creme into small microwaveable bowl; set aside. Whisk remaining Cooking Creme, eggs and black pepper in separate bowl until well blended. Melt margarine in 10-inch ovenproof skillet on medium heat. Add green peppers; cook and stir 5 min. Stir in onions, ham and egg mixture; cover. Cook on medium-low heat 9 to 10 min. or until centre is almost set. Top frittata with cheese. Broil, 6 inches from heat, 2 min. or until centre is set and cheese is melted. Microwave reserved Cooking Creme on HIGH 10 to 12 sec. or until warmed. Drizzle over frittata. Substitute: Substitute a red pepper for the green pepper. Note: If your skillet has a plastic handle, wrap the handle with several layers of foil before using as directed.